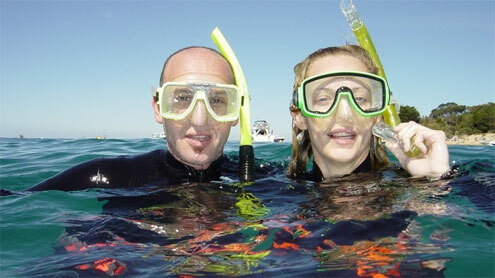 This is a list of the sites in and near Melbourne that we consider to be Ideal for Snorkelling. Click on the 'Read more about' link for the snorkelling site and you will be taken to the section of a web page where we show all of the information we have for the site. Depth: 2 to 12 m.
Depth: 1 to 8 m.
Mean water temp - summer: 20.0°C. Mean water temp - winter: 11.2°C. Iron hulled, two deck, three masted ship, 1523 ton. Depth: 3 to 7 m.
Depth: 0 to 7 m.
Total of 92 dive sites. See also, Snorkelling in Melbourne.